There is no need to take the TN Litmus Test more than once. It works the first time, all of the time; 100% guaranteed. Ralph Adamo – you had your own sandbox as a kid, didn’t you? Pretty words. I would copy and paste more excerpts but being a PDF makes that difficult. Yes, you can read this and be lulled by the benign sounding ‘for the common good’ rhetoric but if it does not creep you out, something is terribly wrong with your instincts. If you have not watched the videos I posted more than once from the Chinese women who is trying like hell to warn us that what she left China for is happening HERE through Common Core, then you may just be duped into sleeping through this like everything else. In light of this rant of yours on a previous thread, Ralph, your renewed unhinging right here is not surprising. You and Netanyahu take from the same well, conflating Israel with Judaism, when MOST Jews distinguish between the two. If I can take a Ted Nugent attack on Obama as solely an attack on Obama, you can take a Ted Nugent attack on specific Jews as an attack on specific Jews, not on Israel or all Jews. Grow up and stop whining, especially in light of your willingness to trash others. This Jonathan Turley article is another anti-Israel piece of clap-trap crap written by an anti-Israel leftist for other anti-Israel readers. Naturally, such an article is necessarily short on facts and analysis (if any can be found at all) but loaded with leftist anti-Israel propaganda. Thus, leftists like Jimmy Carter have called for a plan to deal with carving up Israel that Carter himself has called the “final solution.” Yes, he used the same words that Nazis used because Carter is actually one of the more honest anti-Semites and enemies of civilization in that he doesn’t attempt so much to hide what he’s all about, just like his soul-mate David Duke could be called “honest” in this regard. The TN Litmus Test: 100% accuracy guaranteed. Thus it is written. Thus it is ever so. Two individuals – to cite just a few here — prove the accuracy and reliability of the Ted Nugent Litmus Test, as they attempt to protect, shield, defend, or otherwise deflect criticism of Nugent’s statements. The TN Litmus Test is unfailing. Thus it is written. Thus it is ever so. Sorry but you’re wrong. He just dares to call out the bad guys EVEN IF THEY’RE JEWISH! How radically courageous is that? I believe he’s challenging us- pushing our buttons daring us to do the same. If he criticizes a white woman for ANYTHING, he’s a misogynist, but that won’t stop him. If he criticizes a black man for ANYTHING, he’s a racist. If he criticizes a black woman they’ll have to flip a coin or he’s just guilty of both, but that won’t stop him. If he criticizes a Jew, he’s rabidly anti-Israel and anti-semite. If he criticizes a white man, he’s justified. Wrong again. Like Donald Trump’s popularity keeps rising, so will his, and so will the NRA’s. Just look up the increases in gun sales after every so-called terrorist attack..
You say many of the strongest 2nd Amendment defenders? How many is many? The ones they find to put on mass media? Where do you find these many? As I indicated, the Ted Nugent case is now the perfect litmus test for defining you. If you honestly believe that Nugent’s statements are vile, then you are unlikely to be a Neo-Nazi. But if you don’t find Nugent’s statements to be objectionable, then you are certainly a Neo-Nazi. Naturally, supporters of Islam, as well as your every day David Dukes, have no problem with Nugent’s statements, and are quietly — if not openly– applauding him. The very statements made by posters to this article prove that this litmus test is 100% accurate. Thus it is written. Thus it is ever so. stevegroen – -5. You are a better reader and thinker than that. po – it is the same problem as “is being anti-Zionist being anti-Semitic?” Nugent has described a group of people (named and shamed). I think he is opposed to a specific group of people, not all Jews. My point exactly, Paul. I do think that Nugent, though himself a poopypants, made an argument that is not wholesale cut and dried. AS you said, in both cases he targeted some individuals among the larger group…just as he did when he targeted Obama, not black people. Those trying to enforce a subjective litmus test are the antisemitic ones for trying conflate the few with the many. Your litmus test, Ralph, is not THE litmus test, it YOUR litmus test. And to revisit my point above, unlike Nugent who seems to distinguish between the few and the whole, you, friend, easily and eagerly target the whole without any reserve at all. You have said worse things about other groups than Nugent, how do you reconcile that with your current outrage? Ralph Adamo – it is good you have joined us. I know that you think you can suss out Neo-Nazis, but you are not using the right test or really any test. You are making it up out of thin air. However, making a blanket statement like you have is exactly what Ted Nugent did. 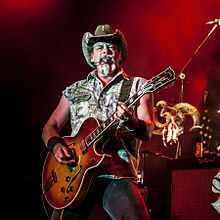 So, if Ted Nugent is a Neo-Nazi you must be a Neo-Nazi. See how that works? Actually, since you think Nugent is anti-Semitic, you think EVERYONE on this blog is anti-Semitic. That is a huge leap. A leap that cannot be made successfully. JT tried it, but he was wrong. Nugent selected a small group of Jews, named and shamed them. You kinda selected a group on this blog but for some reason did not name them, however you tried to shame them. This is the coward’s way. You are right. Ali was willing to go to jail for his beliefs, and was sentenced to five years, but did not serve it as the SCOTUS overturned the conviction. He did lose almost four years at the peak of his career, so either way it’s pretty clear that he was committed to his beliefs, unlike poopypants Nugent.